Potato salad is one of the most basic summer salads you can make. 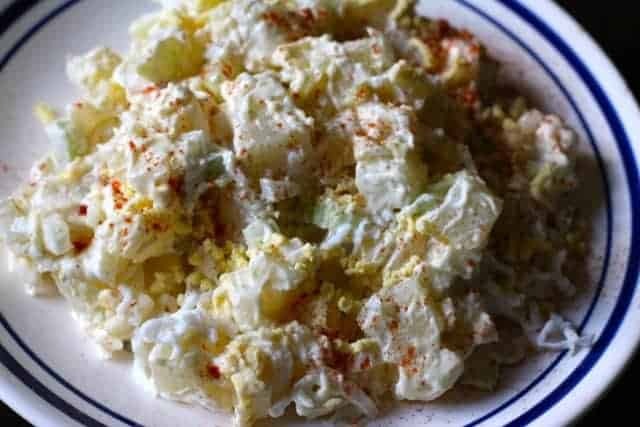 You should never go out and buy potato salad, I know your homemade version will be quite good, and this recipe is very easy to make. When I was growing up during the summer, there wasn’t a side dish that I enjoyed more than potato salad. My Grandmother made the best potato salad in the whole world. I would love it during the summer, my grandparents would grill up pork steaks, and some burgers and they would make homemade potato salad and coleslaw. This was one recipe that I wished that I had gotten from her, was her potato salad. She didn’t use a recipe, she would just put in a little bit of this, and a little bit of that, and it was wonderful. Today I am reaching back into that old home economics textbook in my Learn to Cook Series and we are making a simple potato salad recipe. Potato salad is very easy to make. Potato is simply boiled potatoes, celery, 2 boiled eggs, pickle relish, chopped onion, and mayonnaise. You might wonder what type of potatoes you should buy. I love Russet potatoes for this salad. You can use other types such as Yukon gold, but I like how this potato holds it shape. I think the other types are softer after they have cooked, and they don’t work out quite the same. I also suggest that you use white onion if you can. White onions aren’t as hot as yellow onions, so white onions tend to be better for recipes that the onion isn’t cooked. You can mix in other things into potato salad. Some people like to put in some chopped apple, chopped bell peppers, or even frozen peas. You may also want to add about a tablespoon of mustard to this recipe if you desire. I know some folks are very anti mustard when it comes to adding it in your potato salad. Remember to store this salad in the refrigerator. Making potato salad doesn't need to be hard at all. 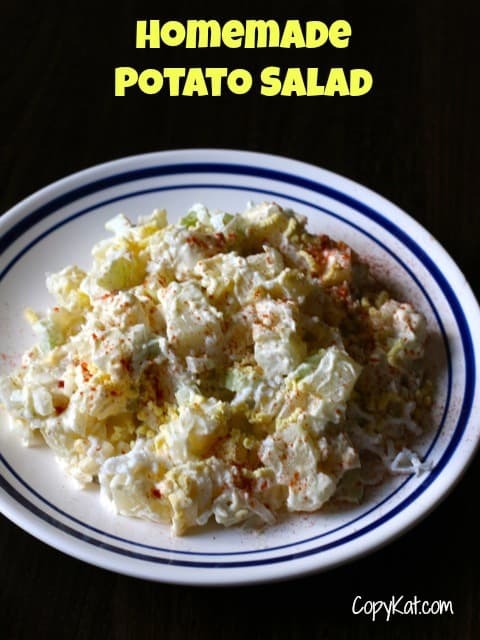 Even if you are a beginning cook, you can make delicious potato salad. Wash potatoes to remove any excess dirt. Boil potatoes (leave them whole) in a large pot. Add enough water to cover the potatoes with an additional inch of water. Cook potatoes on medium-high for about 30 minutes. Test potato doneness after 30 minutes by piercing them with a fork. If the fork goes through the potato easily, they are done. If the fork won't go through easily cook for an additional five minutes and test again. When potatoes are done, allow them to cool until they can be handled easily. Rub off the skin. Dice potatoes and place them in a bowl. To the bowl add chopped egg, celery, onions, chopped pickles/relish. Add 1 teaspoon of salt, and mix in well. Stir in 1 cup of mayonnaise. If desired garnish with additional sliced egg and sprinkle some paprika over. I have enjoyed watching your “learn to cook” videos. However, I have a question. It concerns cooking rice. Some recipes say to rinse other don’t even mention it. So which is it. To rinse or not to rinse that is the question.